The Ocean King by Russ Watts is a deep sea thriller. Retired Navy SEAL Don O’Reilly is working as a security guard for The Wild Seas Park. He drinks to forget his past, living out his life in a tiny apartment, suffering through nightmares every night. But nothing, not even the best military training could prepare him for what he is about to face. An unknown creature is found, half dead, floating in the Pacific Ocean, close to some wreckage. Brought to the Wild Seas Park, the creature is enormous, with a mouth full of razor teeth. The owner of the park, Zola Bertoni, decides that she wants to make her fortune out of this creature but no one could predict the terrifying consequences of putting the Kaiju on show. 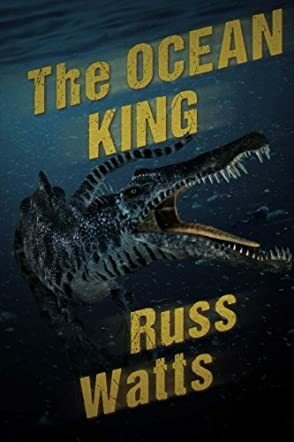 The Ocean King by Russ Watts was a stunning story, a book that might just make you wary of setting foot in the sea again. Jaws, Lake Placid, move over. The Ocean King is more terrifying than both of them put together. Loved the story and I found it to be exceedingly well written. The characters were believable and, dare I say it, so was the story – there really is no knowing what lives in the depths of the ocean and who knows, maybe there is a Kaiju down there somewhere! Excellent story, this was one book I did not want to put down until I had finished it. Looking forward to reading more from Mr. Watts in the future. The Ocean King is a horror novel written by Russ Watts. Don O'Reilly is an ex-Navy SEAL who is currently the head of security for Wild Seas Park. His service in the Navy has left him with a recurring nightmare about a failed operation in Somalia. His lifeline is his young friend, Amanda, one of the animal trainers at the park. Her boyfriend, Hamish, works with his father, Curtis, on his fishing sloop, and the two encounter a strange prehistoric creature floating out at sea. The creature seems lifeless, so they decide to bring it aboard. When they arrive back on shore, the creature is stirring and Zola Bertoni, the director of Wild Seas, quickly offers Curtis a hefty price for it. She's planning a grand event where Diablo will be introduced to the public. Russ Watts' horror action novel, The Ocean King, is a clever, modernized homage to the Godzilla movies of the fifties. I had a lot of fun reading this book and even did a Google search to see pictures of the dinosaurs Amanda thought might be the ancestors of Diablo. The psychological aspects of The Ocean King were also riveting. Don is a marvelous main character who is clearly tormented by his past. His childhood was cut short by his dad's premature death and his mother's physical abuse, and his tour as a SEAL ended in tragedy. The images of him quietly depositing thousands of dollars into an account to support the mother who despises him are haunting and sad. The Ocean King is an exciting, fast-paced and enjoyable story and is recommended reading. In The Ocean King by Russ Watts, Don O’Reilly, a retired Navy SEAL, is now head of security at Wild Seas Park in San Diego. Suffering from constant nightmares about his time in the military, he drinks to forget it all. Thinking he could just live out his life, he never expected a giant sea creature to be brought to his place of work. After it was found in the Pacific Ocean, it was brought to Wild Seas to be studied. However, the only thing that the owner of the park, Zola Bertoni, sees when she looks at the creature is dollar signs…lots of them. She wants to draw in millions of viewers and make a spectacle of this new-found dinosaur-looking beast. With Zola only focusing on the large amounts of cash she will make, Don may have to use his expertise and skills to stop a very dangerous creature from wreaking havoc. As a fan of Godzilla and a new fan of Russ Watts, I jumped at the chance to read this book. I was instantly intrigued by this sea creature, and even though I knew it wasn’t going to end with a happily ever after regarding this beast, I was very curious as to how it would all play out. I could have done with more action scenes and perhaps a faster pace at some parts, but overall, I genuinely enjoyed the plot. I found myself sympathizing with both the humans and the sea creature, which is thanks to Watts’ great writing. I could easily see this being an entertaining movie. The Ocean King is a suspenseful and sometimes horrific read that will surely satisfy readers of this genre.